Today (Saturday): Drizzle to developing sun. Mild. 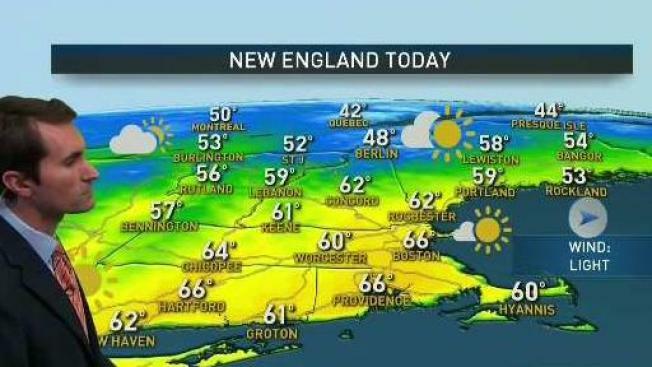 Highs in the 60s to near 70. Overnight Saturday: Mostly clear. Lows in the 30s and 40s. Sunday: Pleasant and mostly sunny with sea breezes. Highs in the 50s coast, 60s inland. Overnight clouds and showers are quickly pulling away, allowing sunshine to take over for most of Saturday. With the help of that sunshine today high temperatures will soar into the 60s and even close to 70 in some cases. Skies stay mostly clear tonight with lows holding in the 30s and 40s. Early sunshine on Sunday will give way to increasing clouds, with highs still reaching the 60s through the interior. At the coast a little bit of a seabreeze will keep us a touch cooler, in the 50s to near 60. Our next weather system brings clouds and periods of rain showers back on Monday, with some wintry mix and snow in far Northern New England. The good news is that we’ll likely only have a few spot showers on Tuesday for opening day at Fenway Park. Expect very similar conditions on Wednesday, even though we’ll still have lots of clouds both days. High temperatures next week look to be close to average, which around Boston is the low 50s.